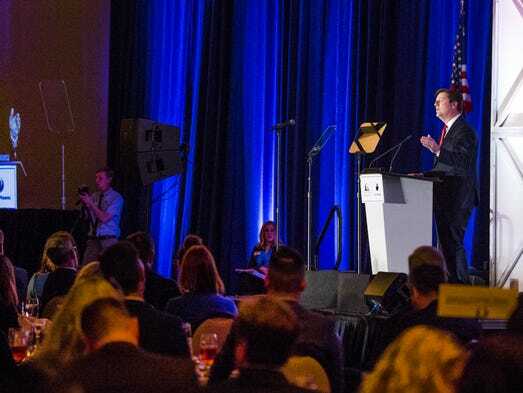 During his address, Mayor Stanton shared that „Governing Magazine, named Phoenix one of the highest performing city government in the Nation“. The Phoenix Metropolitan area has increased in popularity in recent years for new business. It has been recognized as „one of the top cities for startups and young professionals”. This can be seen in the growing numbers of new graduates from other states who are taking up residence in Arizona. Companies like Intel, Amazon, Apple, Uber, and Google have invested large sums of money in Arizona and as a result, Phoenix Metro is “3rd in growth for high tech jobs” with the „highest wage growth of any region in the USA”. Small businesses have raised their wages here more than anywhere else, and Phoenix boasts “near record low unemployment rates”. Metrics like this make it easy to see why Phoenix was named “one of the top ten growing economies”. Mayor Stanton also talked about Phoenix’s triumphs and advances in biosciences, transit, sustainability, social justice.